Want to be one of the 1,000 people in 1,000 days? Call Rural Dynamics at 761-8721 to get started. More than 75 employers and community leaders attended the Prosperity Matters launch March 1, when nine nonprofits and government agencies announced the goal of placing 1,000 people who are struggling financially on the path to prosperity in 1,000 days. Work on the initiative began in 2013, when United Way, Rural Dynamics, NeighborWorks and Opportunities Inc. reached out to nearly 100 local people who were struggling financially to talk to them about what prosperity looked like to them and to identify common barriers to them achieving financial stability. The partnership expanded to include Job Service, Great Falls College –MSU, Family Connections, Great Falls Development Authority and the City of Great Falls. United Way President Gary Owen said of the nonprofit’s focus areas of education, financial stability and health – income is the biggest challenge to advance. However increasing the number of financially stable families is critical to the success of the community. “We live in a community with virtually full employment and yet nearly half of our public school students eat free and reduced lunch,” Owen said. “Through the Graduation Matters initiative, we’ve seen how students from low-income families are more likely to dropout. And we know that children born in poverty are more likely to be abused and neglected, to have medical problems and mental health issues. As part of the event, the first Prosperity Matters report was released, pointing out key data points that both define problem areas and strategies to impact the issue. Prosperity Matters partners spent a lot of time researching data and also finding common ground that people from all political perspectives could agree on. The Prosperity Matters initiative doesn’t aim to end poverty, but instead is focused on families who are working, but continue to struggle. In Cascade County, while one in seven people live in poverty another one in five are a broken transmission or a broken leg from financial disaster. Already, the Prosperity Matters partners have worked on projects that help working families find better paying jobs. With Great Falls Job Service and Great Falls College, United Way has worked to get employees opportunities to earn National Career Readiness Certificates, a test that determines a person’s soft skills. And worked with local employers to recognize the value of the certificate when making hires. Another pilot project is underway led by Great Falls Development Authority that is working to recruit 100 underemployed people and give them the opportunity to interview for higher wage jobs. In addition to tracking the number of people helped, the partners will track the number of people living in poverty, the percent of homeowners and the percent of workers earning less than $25,000 annually. By improving these three areas, the initiative will be making a communitywide impact. Furthermore, if the numbers don’t change, the partners will know to change direction. 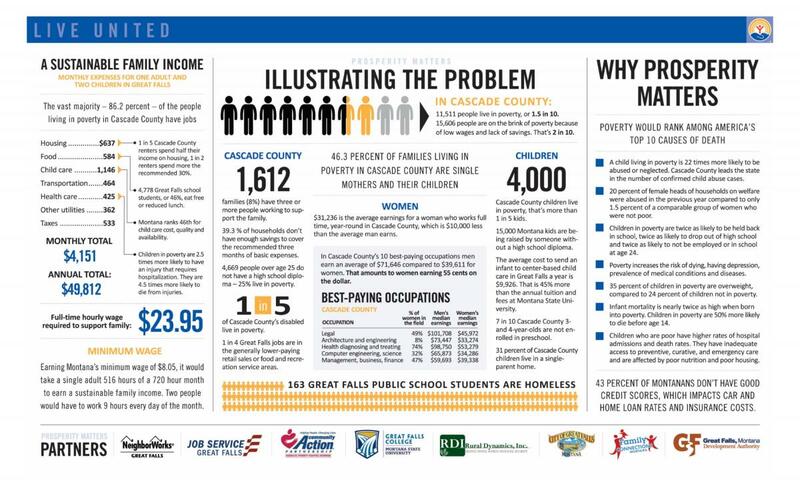 According to the census, 11,511 people in Cascade County lived in poverty in 2014, which is up from 10,865 in 2009. The number is based on federal standards, where a family of three earns $20,090 or less annually. In 2014, 61.8 percent of Great Falls households are homeowners, compared to 64.8 percent in 2010 and 67.7 percent statewide. Owning a home is often a family’s biggest asset and is critical to creating a stable budget. In Great Falls, 34.2 percent of all workers earned less than $25,000 last year. That’s compared to 24.8 percent statewide and just 16.8 percent nationally. According to MIT and the Economic Policy Institute’s budget calculators, a sustainable income for a family with one adult and two young children is $49,812 in Cascade County. Tuesday’s kick off is part of an awareness campaign that will share ideas for how employers, agencies and community members can get involved in increasing the number of families who are financially stable. 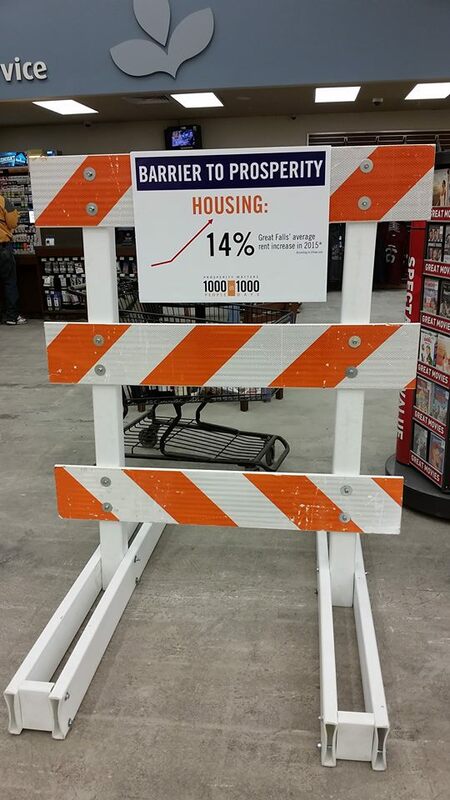 For the next two weeks, street barricades will be displayed inside various high traffic businesses, each with a sign and a statistic to illustrate the barriers to prosperity that people in Cascade County commonly face. · Mentor a struggling student – dropping out of high school is the biggest predictor of income struggles. Call United Way at 727-3400. · Be a financial mentor – you don’t have to be an accountant to help coach a struggling mom. Call Rural Dynamics at 761-8721 or Great Falls Development Authority at 771-9020. · Advocate for a state child care tax credit. · Visit www.pay-equity.org to learn about a simple process to conduct a gender pay equity audit. 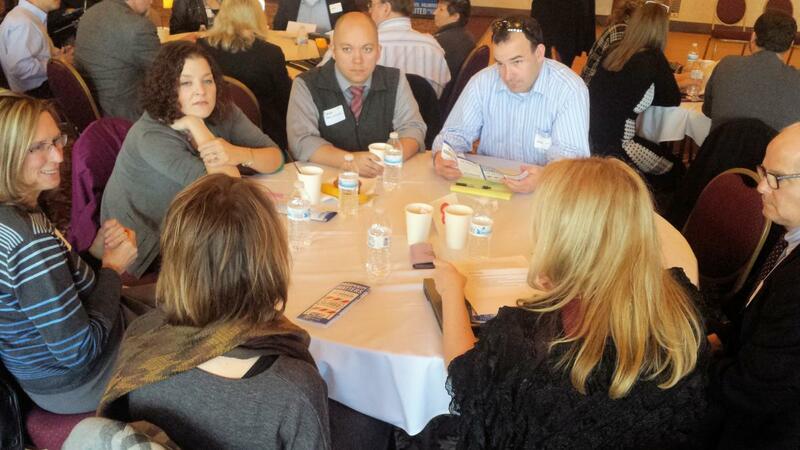 · Take part in a half-day poverty simulation exercise. Call Rural Dynamics at 761-8721. · Brag if your business pays well. Learn about other benefits you can offer to attract workers and help your employees by calling Job Service at 791-5800.